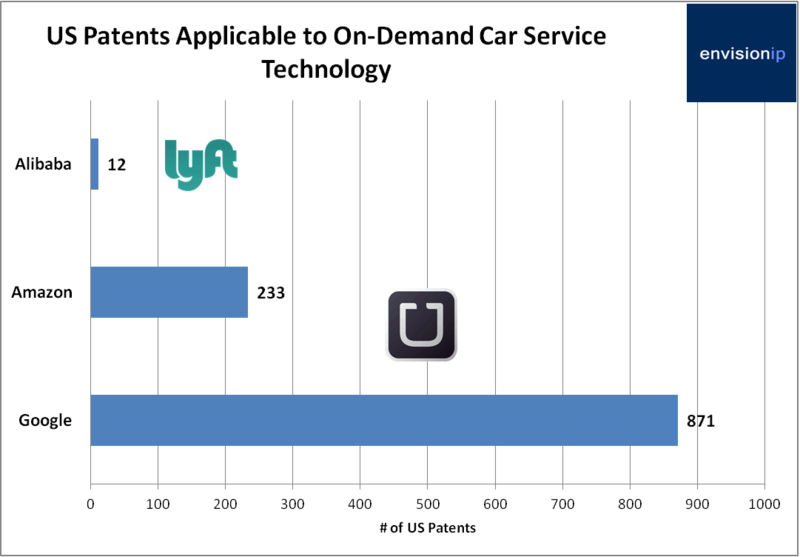 This past March, Envision IP analyzed the patent portfolios of major on-demand car service companies. 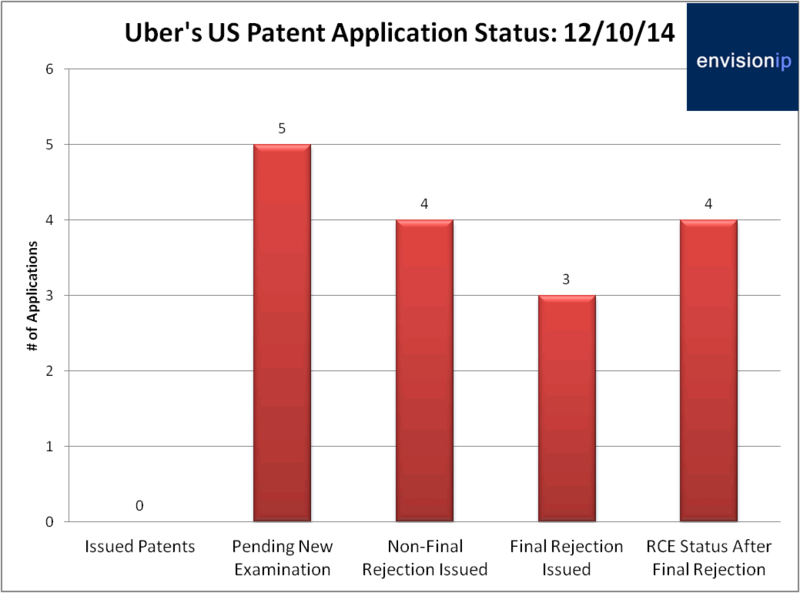 At that time, there was very little patenting activity among Uber, Lyft, Sidecar, and others. Considering the tremendous growth of this industry, and with Uber’s $40 billion valuation on the heels of a $1.2 billion financing round announced last week, Envision IP revisited the patent portfolios of these companies. Uber Technologies Inc. (“Uber”) currently has 16 pending, published US patent applications, and no issued patents at this time. Since our last look in March, 5 new patent applications have published related to GPS-based vehicle tracking, user interfaces for confirming passenger pick-ups and drop-offs, toll calculation, and generating customer receipts and promotions. In addition, we identified 4 additional applications that name Garrett Camp, Uber’s co-founder as an inventor. These applications were filed in December 2009, shortly after Uber’s launch, and are all entitled “System and method for operating a service to arrange transport amongst parties through use of mobile devices.” These applications appear fundamental to Uber’s business model, and all 4 are in a “request for continued examination” (RCE) status. The data above suggests that Uber is having a difficult time in obtaining relatively broad patent claims around its on-demand car service model. While this industry is fairly new, there are likely patents in this space that predate the launch of many of today’s players. For example, we have identified patents related to location-based ride-sharing and car-pooling owned by IBM, Hewlett-Packard, Microsoft, and Ericsson. Given the patent acquisitions trends set by Facebook and Twitter at times close to their respective IPOs (Facebook acquired 650 AOL patents from Microsoft for $550 million; Twitter acquired 900 patents from IBM for $36 million), a patent purchase in the near future by Uber could be very likely. With a staggering valuation, the company may be a target from other patent owners, and may want to defensively acquire patents surrounding various aspects of its business in order to mitigate its litigation risk. Regarding Lyft and Sidecar, both of which are considered to be Uber’s main US competitors, these companies have very little patenting activity, with no updates since our review in March. Lyft currently does not have any issued US patents, or any published US patent applications. Sidecar has one issued US patent. Sidecar has 2 published US patent applications, both of which are abandoned. Uber’s investors include Google Ventures and Jeff Bezos, founder and CEO of Amazon.com. We analyzed Google and Amazon’s patent portfolios to determine if these companies have patented technology which may be applicable to the on-demand car service model. These technologies include passenger and driver matching, vehicle routing and tracking, navigation systems, mobile payments, and mobile notifications. Not surprisingly, Google owns 871 patents across these areas, with 6 issued patents specific to driver/passenger matching. Amazon owns 233 patents across these areas, with the bulk of these patents in the mobile payment and mobile notification space. Lyft, on the other hand counts Alibaba as an investor. Envision IP analyzed Alibaba’s patent portfolio this past May, and while the portfolio appears impressive, we identified only 12 patents which may be applicable to the on-demand car service model. Alibaba acquired a number of patents from Yahoo in 2013, and we suspect some of these patents may also be relevant to mobile payments and notifications, but currently the specific patents purchased are not publicly known. Overall, from a patent protection standpoint, Uber appears to have laid the groundwork to protect its core business model, and perhaps it will be able to leverage patented technology associated with its investors that is ancillary to various components of its service.